Promotional Booklet - Flottman Company. Create an engaging and informational promotional piece that encourages sponsorship for the Annual Disabled Veterans Winter Sports Clinic. Produce an informational booklet that conveyed event information in a visually interesting way. The bright, bold promotional booklet clearly explains the event and the need for sponsorship, as well as the personal benefits for event sponsors. Flottman Company was founded as a print service provider, and we are still producing quality printed materials today. With our combined expertise in printing and folding, we are the perfect source for booklets, brochures and more. 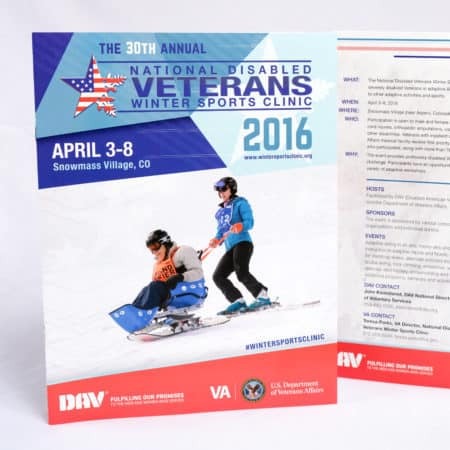 We produced this promotional booklet for the annual National Disabled Veterans Winter Sports Clinic, facilitated by Disabled American Veterans and the Department of Veterans Affairs. This event promotes rehabilitation by instructing severely disabled Veterans in adaptive Alpine and Nordic skiing and by providing an introduction to other adaptive activities and sports. This allows the veterans opportunities for self-development and challenge. The clinic relies heavily on sponsorship and donations, and this booklet served as a way to encourage sponsorship for the upcoming event. We produced an eight-page saddle-stitched booklet for the clinic. The booklet contains information on the event and its benefits for participants, as well as sponsorship information. The bright colors used in the graphics of the piece allow it to stand out and engage its audience. The high-quality images provide a glimpse at what the event entails. Although the booklet does not contain many pages, it includes all of the information required for companies or individuals to make a decision about sponsorship. By using a high-quality, well-produced booklet, the Winter Sports Clinic was able to establish credibility and reinforce its professionalism. This is very important when asking for sponsorship dollars. In addition, since we were able to produce the entire piece in-house, we could offer a quick turn-around time. Do you need a promotional booklet for your company or event? Request a quote today!